Nothing's worst than an Oculus gone bad when you have friends that you only see a few times a year over to check it out. After months of all the hype of getting together for a weekend of food, drinks, retro gaming and using the Oculus with the Virtuix Omni (I finally received after 4 years), the virtual reality part did not happen. I moved my PC from my office on the second floor to the basement because that's the only place I could put the Omni. I left the 2 sensors I used with that PC in my office to use the Oculus with my other PC when I develop. I purchased 2 other sensors and Touch controllers for the basement. I went through the process of connecting the sensors and the Touch controllers and they were detected without any issue. I used extension cables for the newly connected sensors and the Oculus. When the setup got to the part where you would put on the Oculus, nothing happened. Black screen, amber light. I tried a variety of "fixes" from other people having similar issues such as unplugging, restarting, uninstalling/reinstalling, trying different ports, trying it without the extension cables but nothing worked. 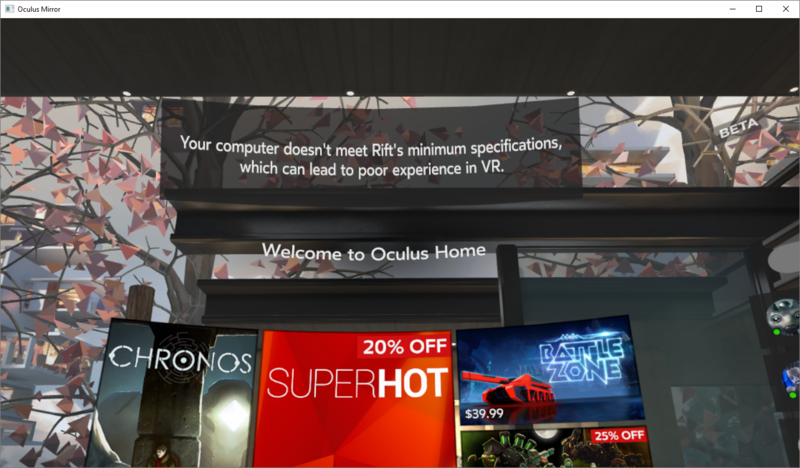 So far I'm only able to hear the sound from Oculus Home or whatever else I launch but can't see it within the Oculus. I have yet to try the original sensors or see if I can remove the sensors from the settings to see if having 4 sensors in the settings even if the original 2 are not-in-use/disabled have somehow messed things up. I also haven't looked at the log but I'll try to do that when I get home after work. I just wanted to write this since it was on my mind at work and hope someone can offer any suggestions that worked for them. It seems like a lot of people are having this issue but with different fixes and from what it seems, unknown causes. I had 2 TV's setup and having my friend point out how the older gaming consoles (Nintendo in this case) started with no problem on TV #1 but the future tech is having problems without a quick fix on TV #2 increased my frustration and disappointment. I hope I'm able to find a fix and hope if it happens again in the future I know EXACTLY what cause it and how to fix it on the spot. Interesting, I have exactly the same issue today. I know that some of the drivers have recently updated, as well as some from Nvidia. Mine was working for more than 3 years up until a few days ago. My rig is DK2 on an alienware 18 (2x GTX880m cards in SLI), it's ran without issues until now despite warnings since the advent of '10 series cards, that my PC does not meet the minimum spec. @Boterick, having you tried rolling back the Nvidia drivers? Could you hear any audio? I too had my headset disconnect yesterday for the first time (black screen, amber light), but I could still hear audio. I thought it may have had something to do with me leaving the headset connected to the PC when I powered down the night before, so I restarted the system then connected my headset and it was fine. I know that our issues are likely not connected, but still I'm curious. 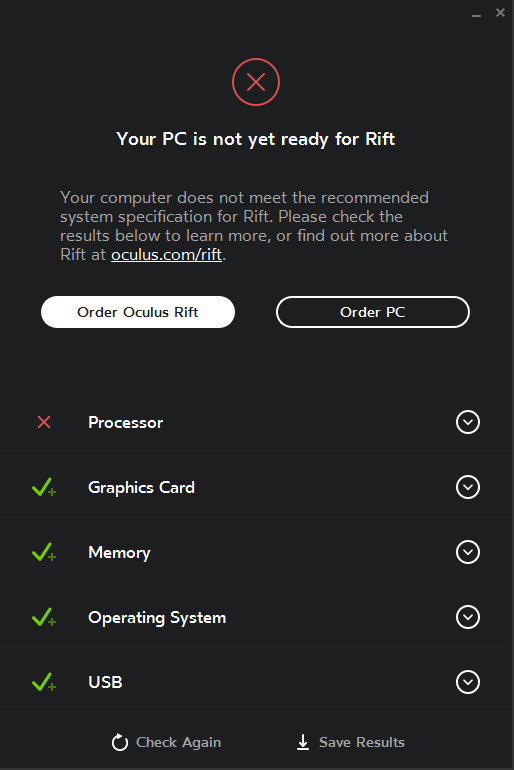 My Oculus stopped work after updating Nvidia drivers to 382.05. I rolled back to previous version. @Calmfixup I could hear audio. I've always left my Oculus connected since I first received it and never had a problem. Unfortunately for me, restarting didn't work. @ksn I couldn't get to it today but I'll definitely check tomorrow. I'll also check on my other PC too where I haven't setup my Oculus before. @ksn my drivers were 382.05 and 382.33. I tried setting up the Oculus for the first time on my other computer: Sabertooth Z77 Motherboard, Windows 10 Pro 64-bit with an i7-2600K, 32GB RAM, and GTX 1070. That didn't work..... it had the same result as my other computer. I hear the audio but nothing else. All of my ports are fine. I have no problem with using any ports on anything other than the Oculus at this port. The whole port issue is rather ridiculous in my opinion. Tomorrow I'll roll back the Nvidia driver even further than I already have and uninstall/reinstall everything again and run the diagnostic tools to get logs to post if there's any issues. Wish I understood what "roll back the drivers" even means?? I hate FAcebook and my Oculus because I wasted 2K on a bran new Alien Computer and the Rift, worked fine for the first 2 months, then had the same damn issue. Updated some USB bull crap and BOSD. I think I got ripped off, and am not a fan of oculus for never taking their time to talk to their customers who spent as much money as we all did! BS!! I have the same problem days ago, I fix It back to old Nvidia GeForce drivers 376.33, try this. I mate, my GPU is a GeForce 780Ti. - Remove all USB components except mouse&keyboard. - Plug monitor on HDMI and restart. - Install nVidia drivers 376.33 and restart. - Setup and plug Oculus as usual and restart. - Plug all USB devices again. That's work for me, hope help to you, sorry for my bad English. @TonyVargasAparicio you're English is good and I appreciate the steps. Unfortunately I tried those and it's not working for me on my desktop. I was able to quit the setup and get to Oculus Home and by mirroring the display (first image) I can actually see that it works on my desktop, just not in the Rift. 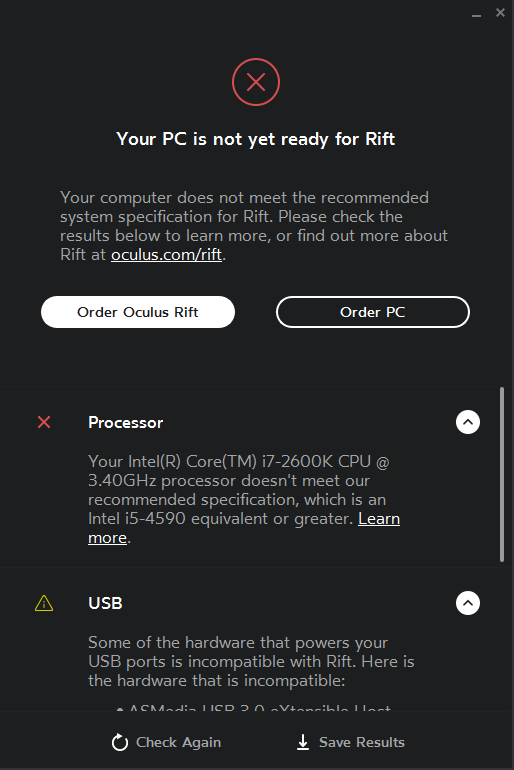 In the second image you can see my PC apparently isn't ready for the Rift but I've seen people with an i7-2600K play the Rift fine. The USB (ASMedia USB 3.0 eXtensible Host) seems to be a different issue. In the last image I uninstalled the USB Host and that removed the problem but using my front USB 3.0 slot didn't resolve the issue either. 2600K works fine, just probably isn't in the lookup table the compatibility list uses. @TwoHedWlf you're right. I'm the type of person that can't stop until I fix it, a condition that's not good for anyone's health. I got it to work. After going through all the steps of uninstalling/reinstalling again I realized there was one thing I didn't try. I switched the monitor HDMI port with the Display Port I always use for the Oculus, even the PC I originally had it on. That seemed to work even with the USB issues displayed in the second image above but I do not have my Rift plugged into that so I'm not sure why it's popping up. Let's hope it continues to work and I'll get to the other PC that really matters by tomorrow. Yes it's not always USB, sometimes using another display port is a workaround. For example my Rift has a HDMI extention which does not work in the regular HDMI connection of my 980ti but it does work when using DVI to HDMI adapter. Only just spotted this thread, but one thing I was going to suggest was to check your Devices and Printers in the Control Panel and make sure that you didn't have an extra display in there. I had a problem before with one of the settings in Steam VR when I was playing around trying to see if I could get HL2 to run in VR. There was a setting that created like an extended virtual desktop display that the VR image was suppose to be sent to. It didn't work with the CV1 though so you ended up with audio but no image. The only way to get the CV1 back as normal again was to go into Devices and Printers and delete this extra display that had been created. So if you get this issue again, for a possible fix, check your Devices and Printers in the control panel and if there is a display there that doesn't belong, just remove it. Generally speaking, I've found that if a problem is due to the port ie a displayport or HDMI, then the headset will not work full stop. As in Oculus Home won't even detect it. @Chazmeister the first thing I did was check the Devices and Printer (or however it's labeled in Windows 10) for my primary VR PC and I didn't notice anything out of the ordinary. I proceeded with the steps that worked for my other PC: uninstall/reinstall Nvidia drivers (with DDU) then Oculus software, clean registry with CCleaner, do not install Geforce Experience, download Nvidia drivers manually, launch OculusMirror.exe if setup failed (which it did in my case) to see if anything is visible, swap ports (Oculus where monitor was via HDMI and monitor to display port), and everything was all good. @Tquad88 if you still need help or more clarity in the solutions in this thread let me know and I'll be glad to walk you through what worked for me. I had the same thing - screen black, amber light, sound was working. I rolled back my drivers to the 376.33 like people suggested, but it didn't work. I ended up buying a 4k display port to hdmi adaptor which fixed the problem. It had to be a 4k-ready adaptor and not a 2k. So now my rift uses a display port and not the hdmi. Cost was about $10. This thread may be relevant. @misssturbo oddly enough I had to switch from using the display port to HDMI on both my PCs and the recent Oculus and Nvidia updates. I was also using the 4k adapter. @cybereality on a PC that I never setup the Rift, I had to roll back to 376.33 for it to work. That PC has a 1070 graphics card. On the other PC that I always used for VR I was actually able to keep the most recent Nvidia driver on there and that has a 980 TI Golden Edition card. Latest on this (BEWARE): I tried to roll back my drivers as suggested. I used the windows control panel "Roll back driver" feature individually for each of my two 880 cards. My system froze with each. After 5 minutes or so waiting for it to respond each time, I cancelled the threads using task manager, assuming the processes must surely be complete. I then attempted restart, and could not even boot into safe mode, just black screen after a few seconds following power up. BIOS reported no graphics hardware found. Yesterday dismantled the system, removed the cards, re-assembled (2.5 hours - alienware 18 laptop), and restarted without issue using MS integrated graphics, hence my ability to post here now. I urgently need to produce some documents with this system, so will use it like this for the moment, but am interested in any opinions on whether or not the system will hang again when I disassemble, re-insert the graphics cards, reassemble, and restart again, whenever I get a further couple of hours to waste. P.S. How can this thread possibly be considered "Solved" ?!? @Boterick @TickTock I didn't mean for it to seem like clickbait. I marked it as solved because I was able to use the steps I posted to solve my issue. I can remove it if it sounds misleading or doesn't seem to fix the majority of issues which may be the case. Glad to hear some folks got over this. My machine is still down. Worse now, after re-assembling with video cards, and found to be still not working, re-dismantled, removed cards again, re-assembled, and now not even starting up on internal graphics, so completely kaput. I gave up on it a few weeks ago, will have another go some other day, but right now working via AWS EC2 server to get my non-rift work done.